It’s New Year’s Eve! Tomorrow is the first day of 2016. 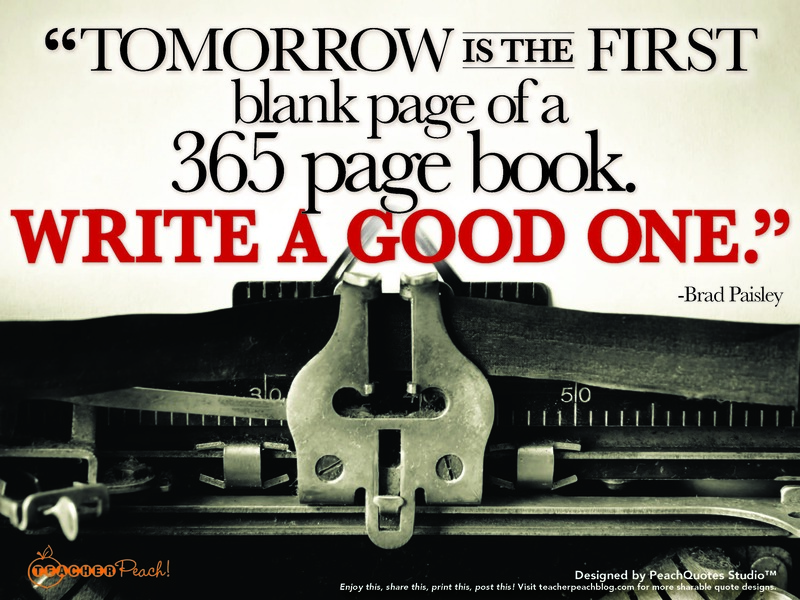 As Brad Paisley says, “Tomorrow is the first blank page of a 365 page book. Write a good one.” This quotation resonates with so many of us. Each year, no matter how wonderful the past year may have been, it is simply human nature to crave a do-over. The fact that this quotation references writing and books makes it all that much more attractive to and resonant with teachers and educators as well as those of us who support them. The concept of beginning each year with a fresh slate, a fresh start, and brand new book yet to be written is a compelling notion. It permits us to let go of the old and think in new ways, start new habits, and go off in new directions. The start of each year brings with it hope and confidence that the year to come will be even better than the one to which we bid adieu tonight. What are you planning to write in your new 365-page book? As teachers, you’ll no doubt will be tempted to begin with brainstorming maps, proceed to your scope and sequence, plot outlines, and chapter synopses. If only we could truly control the plot lines of our year as we might when writing a short story or other work of fiction! Instead, we plan, we hope, we try, and we dust off our knees and try yet again. That’s certainly the plan for Teacher Peach. 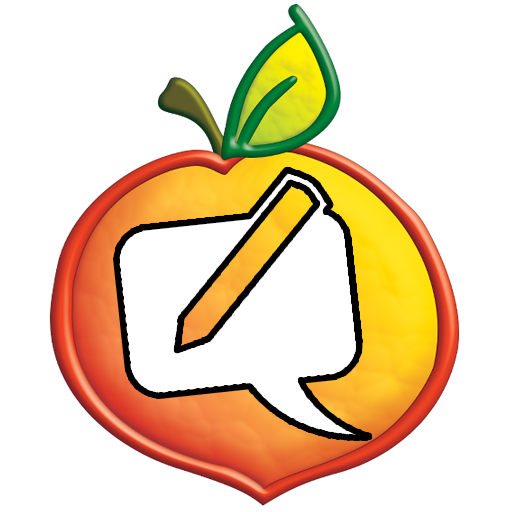 No matter what’s in store for the coming year, the Teacher Peach team knows that, regardless of how well or thoughtfully we “script” our 2016 book, there will be plot twists, set-backs, surprises, the introduction of new characters, red herrings, and even a cliff hanger or two. No matter what, though, we’re excited about 2016. For Teacher Peach, as we continue to grow at this accelerated pace, reaching out to and serving more and more teachers, we know one thing for certain: 2016 is going to be quite the peachy page turner! We truly hope you enjoy a safe and special New Year’s Eve with family, friends, or the rare gift of solitude. Tomorrow not only begins a new day, it also begins a new year. We look forward to spending much of it with you. To inspire you to get your year off to a fresh and organized new start, check out the Get Organized 2016 Products at teacherpeach.com and continue to check our blog for great ideas about classroom re-entry and more terrific ways to begin your 2016. Enjoy tomorrow. Nelson Mandela’s words in PeachQuotes Studio’s Winter Break W.O.W. 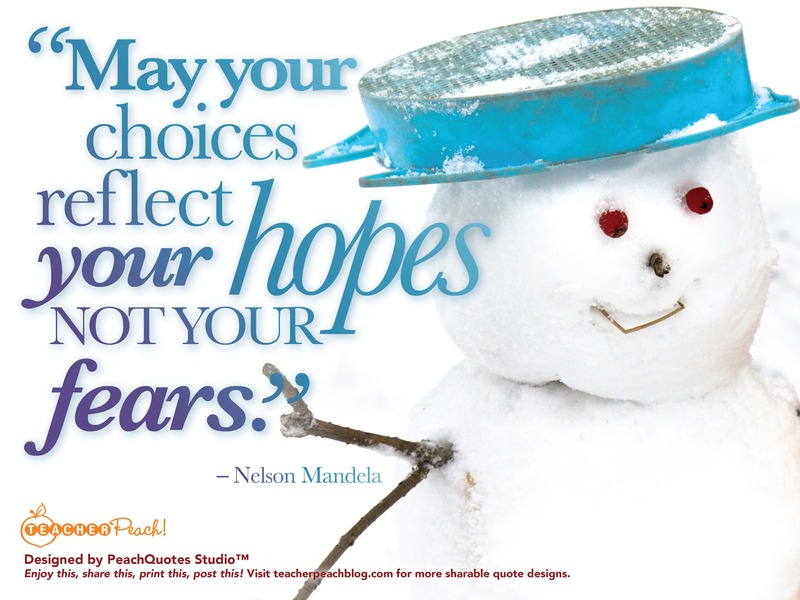 Quotation 6, “May your choices reflect your hopes, not your fears.” is a powerful way to approach 2016. So many of us begin each New Year filled with new resolve, eager to make new and better choices. Yet, many decisions people make are, in fact, driven not by what people hope for and truly want, but by what they fear and truly do not want. When hope is the catalyst for choices, anything’s possible—and when that hope is backed up with focus, commitment, hard work, and talent, many positives are sure to come. My secret? I have a laser lock on our company’s vision to support teachers. This helps me to focus on our hopes, paying careful attention to identify and understand when (and why) a fear or two slips into the mix. I work to listen to our fears, figure out what we must learn from them, use them to help us dig deeper, ask more questions, make smarter decisions—and even better products. Each day, the Teacher Peach team works to make the best possible choices—based on our deep belief in teachers. We anchor our actions to the hope that our work on behalf of teachers does and will continue to make a difference. Our mission to provide social and emotional support to the teachers who support so many is all about hope. Some days, we need to “trust in hopes” because tangible evidence isn’t obvious. Yet, when we hear from teachers who love our products, when a blogger writes a glowing review, or when I board an airplane only to see someone carrying a tote bag I designed to send positive messages about what it means be a teacher—those hope-filled infusions go a long way. They help keep our team on track. What are your hopes for your 2016 choices? Fear not—as they say. If you make a choice that doesn’t work as well as you’d like, just make another one! Check out our choice products for teachers at teacherpeach.com. We “hope” you’ll love what you see. PeachQuotes Studio’s Winter Break W.O.W. Quotation 5! HEARTS truly says it all. 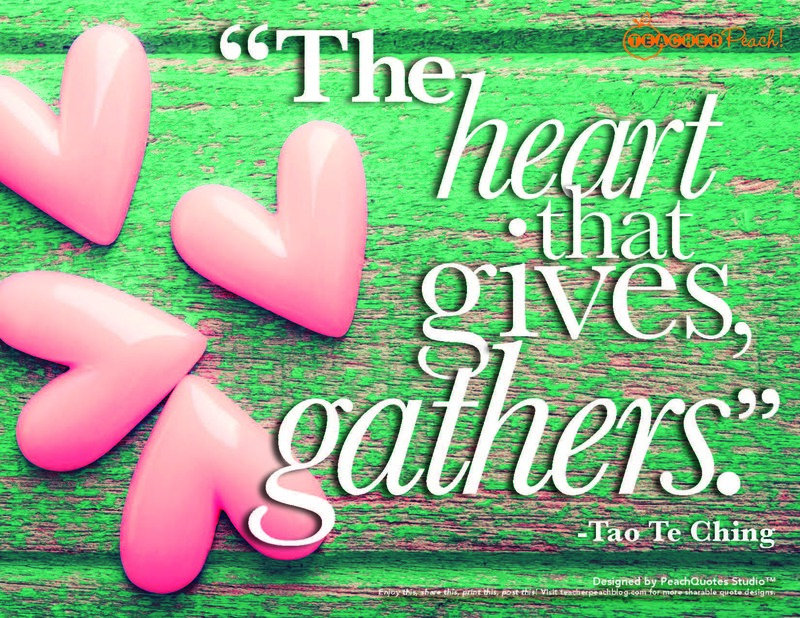 Giving is the key to gathering. As you spend this day between holidays beginning your transition from 2015 to 2016, follow your heart. Give to gather. At Teacher Peach, we have the joyous opportunity to follow our hearts each day to help teachers to feel inspired and motivated. Our mission to provide social and emotional support to the teachers who support so many is a pivotal touch point for each decision we make. As we choose each product, design each message, and carefully make the many decisions that go into each product we offer, we always start from the heart. Teachers are at the heart of everything we do at Teacher Peach. Thanks to the teachers we work to serve and support, we gather so much in return. The many engaged and dedicated teachers who support Teacher Peach inspire us to do our best work—for teachers everywhere. Teacher Peach creates really great products for really great teachers—and it all starts from the heart. To catch a glimpse of what you might gather to fill your heart with delight, visit us at teacherpeach.com over Winter Break to check out our many “heart-built” products, ready to be gathered up by you. Many of the things for which we tend to express our gratefulness fall into two categories: The first category is tactical, like flights and traffic or finding the last parking space at the shopping center. The second category revolves around circumstances far beyond our control like the weather. These events provide relief. That’s what we tend to be grateful for, that feeling of relief. When these are the things for which we are grateful, though, the relief is often short-lived. We move right on to the next events on our dockets, grateful and relieved to be able to get out of the driveway because the snow elected not to fall. A deeper level of gratefulness floods us with something far beyond relief—true gratefulness fills us with happiness. When you search for what is at the root of this deeper happiness, you’ll most often discover—not a WHAT—but a WHOM. The people in our lives, be they family members, students, peers, or friends, provide us with a deeper and more sustaining sense of gratefulness that brings with it a richness and happiness that help us to grow and flourish. 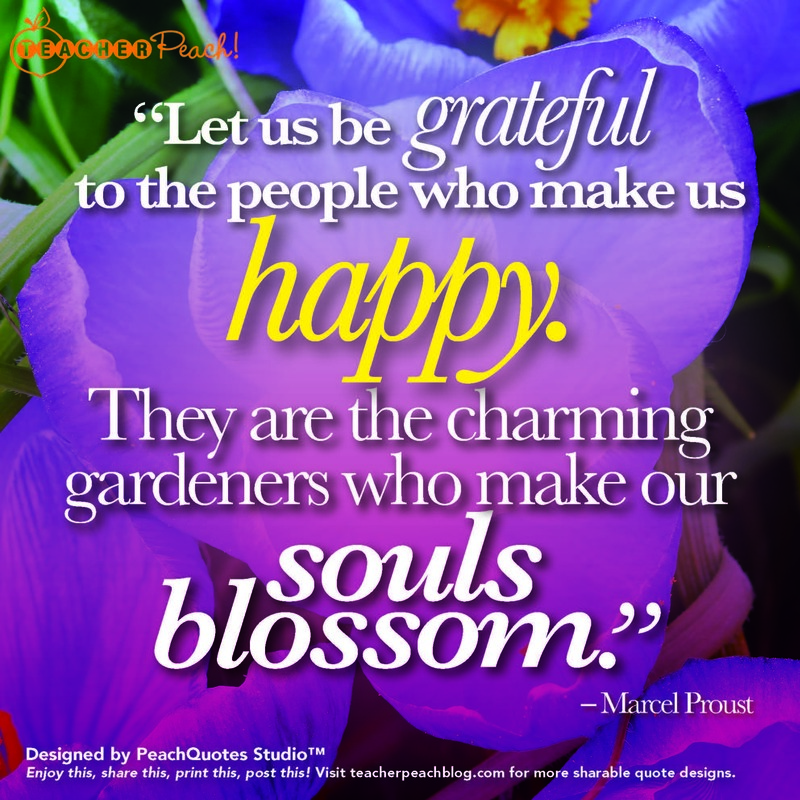 As this quotation so aptly expresses, when we are grateful for the people who make us happy, our souls do indeed blossom. It is our sincere hope that during this holiday season, you and those who make you happy enjoy a true chance to grow and bloom! As for Teacher Peach, we are so grateful for the many engaged and dedicated teachers who support our company because these teachers inspire us to do our best work—for teachers everywhere. Teacher Peach creates really great products for really great teachers. To catch a glimpse of what’s growing in our peach orchard, visit us at teacherpeach.com over Winter Break. 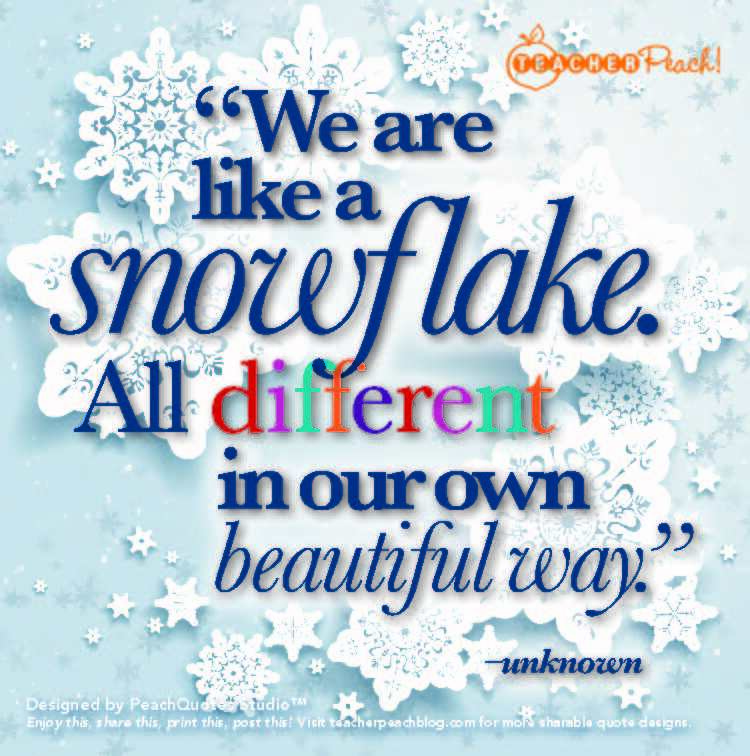 Just like a snowflake, each of us is different in our own beautiful way, as this third quotation, DIFFERENCES, in our PeachQuotes Studio’s Winter Break W.O.W. Quotations Series so elegantly captures. While the author of this quotation is unknown, the message is universal. Teachers strive to teach this vital message of uniqueness every day. Teachers also work to tap into the special strengths that each student possesses, even when those strengths may be deeply masked by other less-beautiful traits. Teachers genuinely believe that students possess such gifts and work tirelessly to discover what motivates each and every student. For teachers, this is all in a day’s work and for many. As a teacher, this ability to look beyond the obvious to discover what’s beautifully unique about each individual could be incredibly handy during this holiday season. As much as this time is about kindness, giving, and sharing, it is also about waiting in long lines, tracking lost orders, and rushing about in a state of utter exhaustion. It’s easy to forget to look for and celebrate these differences in others. Teachers, however, have a leg up, given how intrinsic this skill is in a teacher’s day. As a teacher, you have the chance to model and do what you do so well by teaching others to do this—through your example. So, the next time your family finds itself waiting impatiently to check out of a store behind someone who can’t decide between the blue or green men’s pajamas, try a new approach. Instead of letting that frustration well up inside, recast the situation. If you instead interpret this indecision as great caring, perhaps your time in line will be better spent. You might even tell your kids that whoever is getting those pajamas must be one lucky guy, no matter what color he receives. He’s lucky because the person in front of you spent so much time choosing just the right gift. Of course, if this approach doesn’t work, you might just want to look for a different cash register and hit the holiday cookies as soon as you get home! After all, a snowflake cookie is sure to taste equally beautiful in its own delicious way right about then! Teacher Peach knows that every teacher we serve is also unique. We are aware of the common views, motivations, and commitment that teachers possess. The many engaged and dedicated teachers who support our company inspire us to do our best work—for teachers everywhere. Teacher Peach creates really great products for really great teachers. To catch a glimpse of what makes our company different, visit us at teacherpeach.com over Winter Break. For many of us, today, December 26th, is filled with putting wrapping paper in recycling bins, figuring out where the receipts went, and generally climbing out after holiday pressures and festivities. Today is actually known as National Thank You Note Day, too. As you consider those whom you want to thank for whatever joys they shared with you during this holiday season, it’s a great time to consider the words in today’s Winter Break W.O.W. Quotation 2. 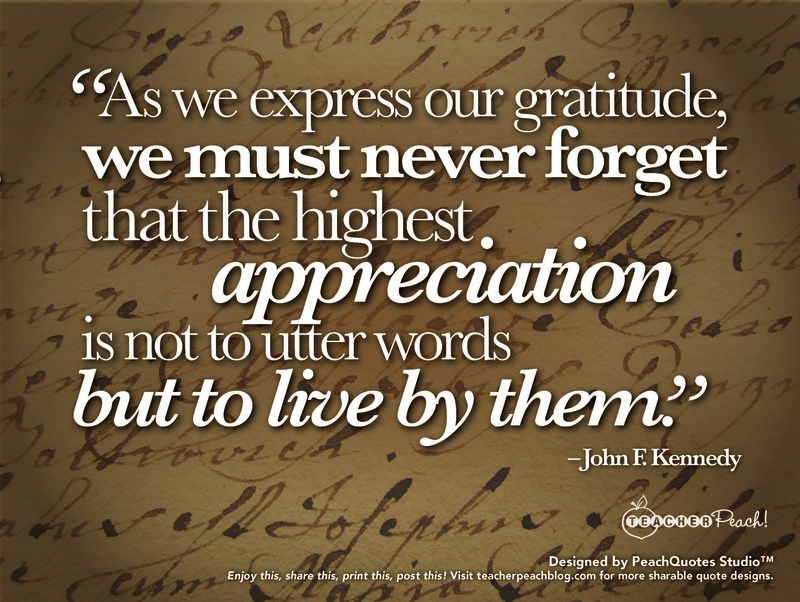 Today’s quotation by John F. Kennedy focuses on our need for gratitude—not just feeling it, but also expressing it. A most eloquent thank you note is always something that reflects doing the right thing. Even heartfelt notes will only go so far until the actions of our lives reflect our gratitude as well. It’s not only about the words in our thank you notes, although they are most often welcome and deeply appreciated by their recipients. It is about something more, something bigger. It is not how we verbally express our gratitude that matters so much as how we express our gratitude through the actions we take, the choices we make, and the changes of which we are a part. That’s living by our words. At Teacher Peach, we live by our ongoing commitment to the amazing teachers and educators we serve. We work to create clear and meaningful messages for teachers, about teachers, by teachers, and in support of teachers—because of our gratitude. We live this gratitude in each product Teacher Peach creates. Just pop onto teacherpeach.com to see what we mean. Each product has been carefully created to reflect the professionalism and dedication that teachers bring to classrooms every single day. To explore more PeachQuotes Studio™ Quotations, visit us on Pinterest and continue to explore our blog. We’d also like to know more about your live-by-your-words actions during this holiday season. Welcome to Teacher Peach’s special Winter Break W.O.W. Quotations Series, created by PeachQuotes Studio™. (W.O.W. stands for Words of Wisdom.) This quote has special meaning. 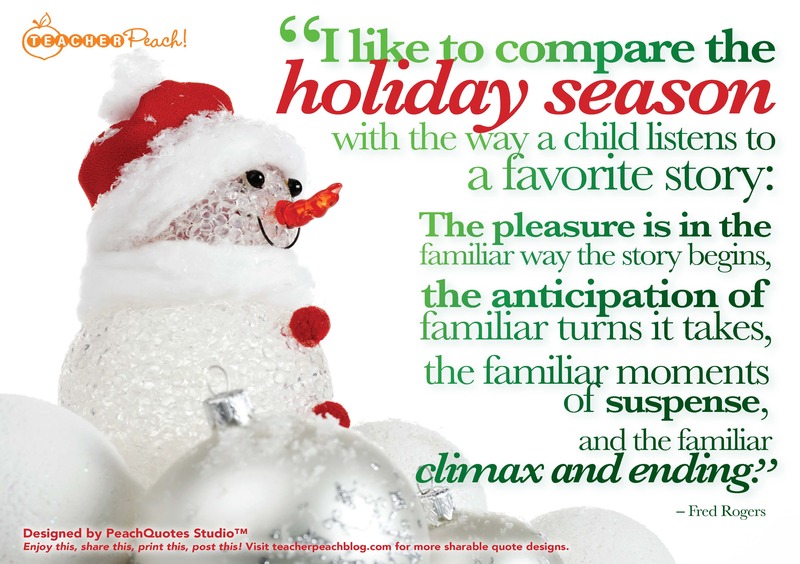 Familiarity at the holidays can be a wonderful feeling. Fred Rogers said it so well. The holidays, by their very nature, are cloaked in the familiar—and that can feel terrific. Do we really want major surprises at the holidays or do we simply want to recreate those warm holiday feelings from our own childhoods? For many of us, these are the feelings we began to crave the moment the weather began to turn. Many special holiday traditions are steeped in familiarity—in fact, did you notice the connection between the words family and familiar? Chances are, we’re all working long and hard to make our holidays the most wonderful time of the year, as they say. The concept of familiarity can be a helpful filter to make choices that really will matter to those who matter to you. Maybe it really isn’t so important to get tickets to that new play. Perhaps your family would be happier going back to the same train exhibit you’ve gone to for three years. What if your family just likes to drive around to see the beautiful lights? The appeal of whatever traditions your family cherishes can often be traced back to their familiarity. Could it be there is comfort in the familiar? Could this comfort help us all to let down our guard a bit and stop to savor the familiar—and family? Here’s to making your holiday story a favorite one—that will stay familiar for years to come. Speaking of years, before shifting gears to launch Teacher Peach, our team spent over 30 years creating classroom curriculum products that teachers use all over the country. We used to work for many of the major educational publishers—so classrooms and teachers were very familiar to us. Now, we create really great products and accessories to directly support these amazing teachers who teach our kids to achieve and grow—and we love it! To “get familiar” with Teacher Peach’s great teacher products, check us out at teacherpeach.com. To explore more PeachQuotes Studio™ Quotations, visit us on Pinterest and continue to explore our blog. We’d also like to know your favorite sentiments during this holiday season. Got any familiar favorites?